1. Preheat oven to 350 degrees F. Grease and flour the bottom and sides of the cake pan, and line the bottom with parchment paper. If desired, use bake-even strips. 2. Whisk together the flour, toasted and ground pecans, salt, and baking soda. Set aside. 3. In a mixer bowl, combine the grated ginger, brown sugar, and butter. Cream on medium until light and fluffy, about 2-3 minutes. 4. Add the eggs one at a time to the butter mixture, beating well after each addition. Beat in the vanilla extract. 5. Add the flour mixture in two batches, alternating with the whole milk. Beat well after each addition, but do not overmix. 6. Pour the batter into the prepared cake pan. Smooth the top with the back of a spatula if necessary. Bake for ~60 minutes until a toothpick inserted into the center of the cake comes out cleanly. Remove from oven and let cool on a wire rack for 15 minutes before removing from the pan and cooling completely. 1. Combine the flour and milk in a small saucepan and cook, whisking constantly, over medium heat until the mixture thickens considerably. Remove from heat and let cool completely. Stir in the vanilla. 2. In a mixer bowl, cream the butter and brown sugar together until light and fluffy and the sugar is no longer grainy. Beat in the flour and milk mixture. 1. 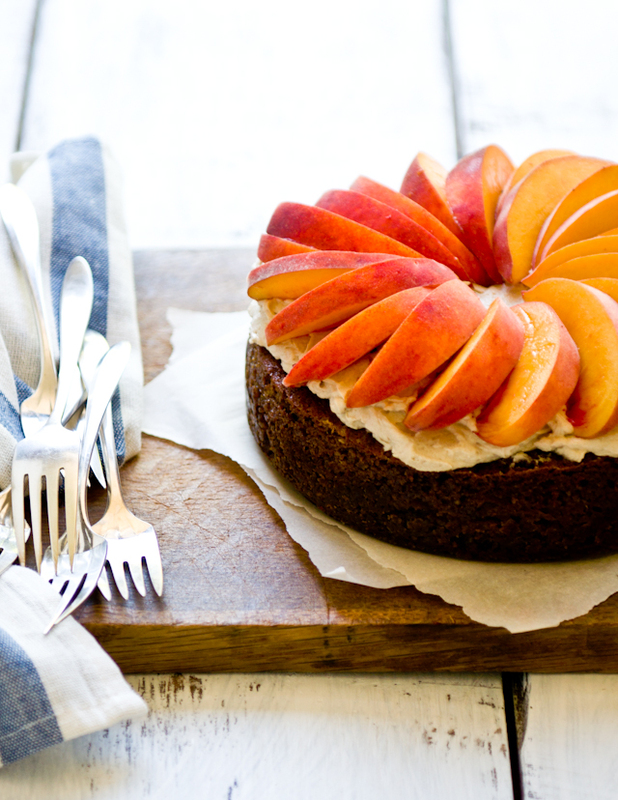 Arrange the peach slices atop cake. cake recipe loosely adapted from Martha Stewart Living. frosting recipe adapted from Tasty Kitchen. 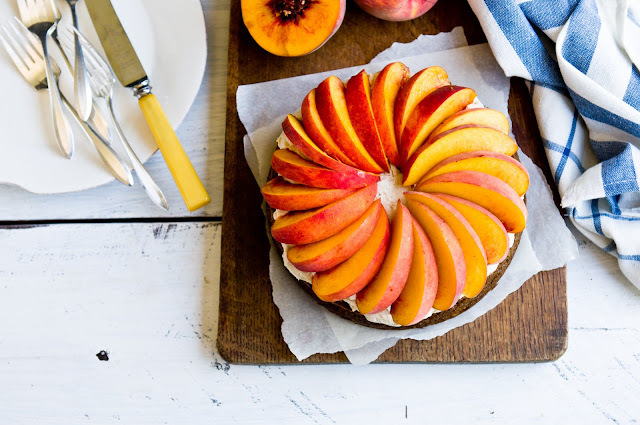 peaches are one of my favorite fruits and this cake looks like perfection! you take the most gorgeous food pictures! Yeah, I am jealous. Always wanted to go to Hawaii! Cake looks super tasty too. So pretty! 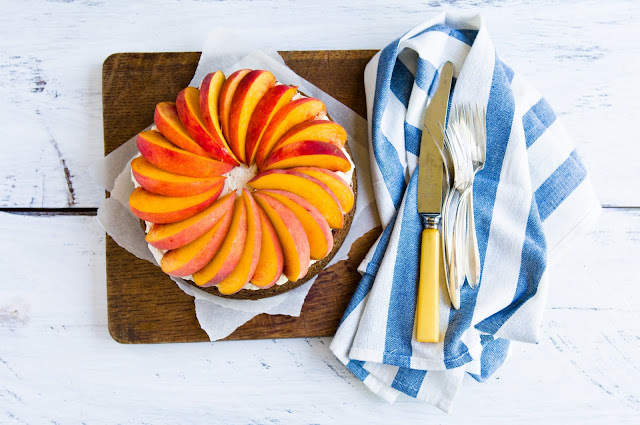 And it seems like the peaches will never run out here, so I still have time to make this. I like how you don't mess with the peaches, you just enjoy them au naturel. Thanks! and these pictures are divine. you are eerily good at this. What a beautiful cake! But what sized cake pan did you use? 9x2 inches? Very nice photography! I like it. Your cake is so beautiful. I love peaches, I can't wait for the season to begin here! Have a fantastic time in Hawaii! I'm very jealous! Ooo! This looks fabulous! 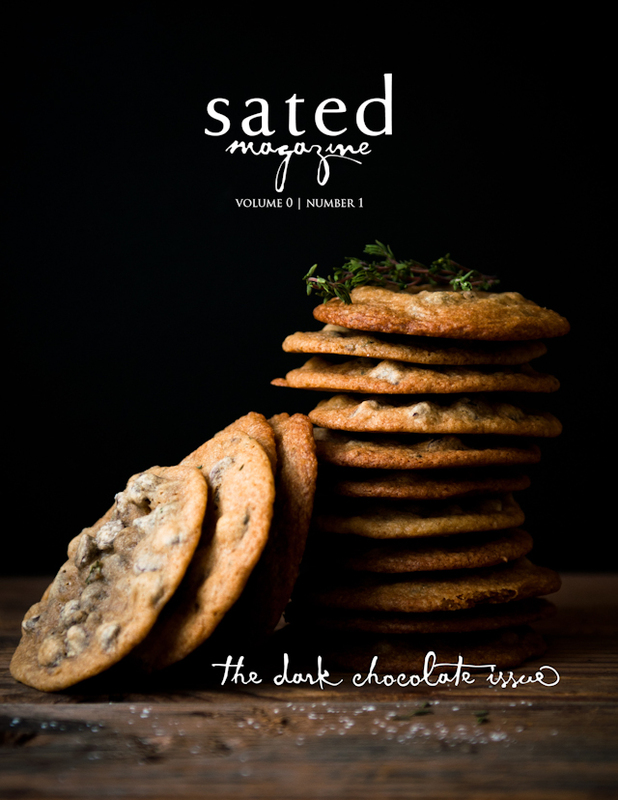 Saw the photo on FoodGawker and just had to click over. I'm making my dad a birthday cake this week and this just may be the one! Stunning photos; well done! I made this in an 8x2 inch pan, but a 9 inch would probably work as well and result in a slightly shorter cake. thanks, alice! that means a lot coming from you. :) loved the photos of your hawaii trip, so i've been excited to go ever since. 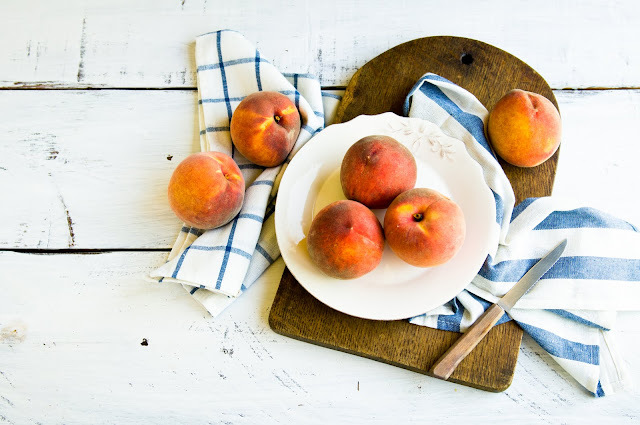 Seeing these photos of yummy peaches makes me so excited for our summer this year! 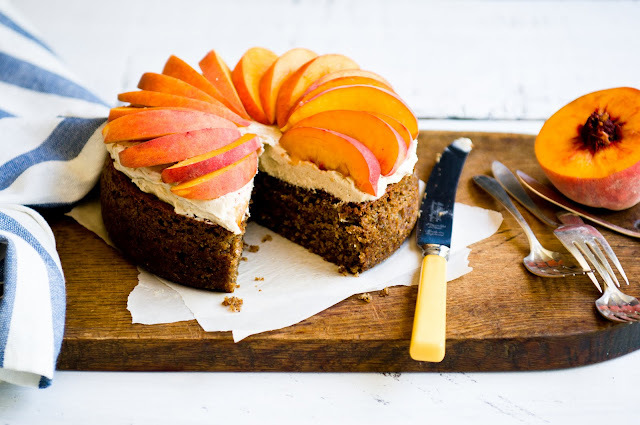 I'll just have to make this when they're in season in Australia - yum! I love your blog! god, peaches. this cake is gorgeous. Can I come over for a slice? Please? Peaches, cream, ginger.. it has been way too long since I've baked or cooked anything. 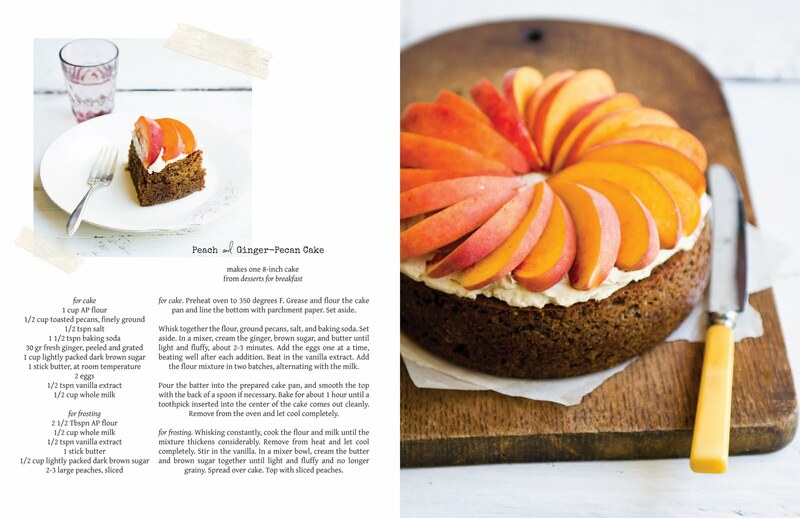 Been up to my ears with "busy"
http://amzn.to/oqXw1R), but, oh, that is so gorgeous (I adore peaches), I so wish we had. what a gorgeous cake! i live on the Big island, can you bring me a piece? i see fresh organic cacao pods from little local farms in the health food store. i could write a book here in your comment section on experiences to have, places to go, places to eat on the B.I.. i have read that some coffee farmers are growing cacao. maybe you will have luck there! Kona Shark's is one farm that i have heard about. Also, spend some time over here on the Hilo side, as well as Kona. The Hilo Bay Cafe is a great place to sample locally grown and thoughfully prepared food. and if you like mochi, please try Two Ladies Kitchen (mochi covered strawberries and other amazing mochi and manju creations). we have a year round farmers market in Hilo that is really best on Wed. and Sat. as for experiences, the road (hwy 137) from Kalapana to Kapoho in the Puna district is the most beautiful little road that winds along the ocean. Waipio valley and the stars at night up on Mauna Kea/Saddle Rd. are also not to be missed. enjoy your vacay and e komo mai! 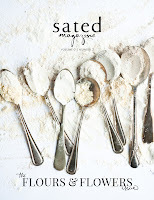 looks like a delicious dessert, and I've never tried brown sugar frosting, can't wait! after you cook and cool the flour and milk what do you do with it...recipe doesn't say. Wow, this is the prettiest looking cake! You must rent scooters/mopeds in Kona and ride them up the coast. It's the only way to see the island! We also went to volcano national park which was kind of a waste of time since it was all the way on the other side from where we were staying. The best beach is the one by the mauna kea resort you have to arrive early since there is a small parking lot and it fills up fast. Coconut island is a fun place to swim and picnic, thats near hilo. I just made this cake today.It was delicious so I had to feature it on my blog.You can see it here http://www.easybakesandcakes.blogspot.com I left a link to the recipe there as well! You'll love the Big Island! My husband and I went for our honeymoon three years ago, and we pretty much drove around the perimeter of the island for the first half of the week before settling at a resort north of Kona for the last couple days. You can have a look at my photo set on Flickr, if you like. (The number of photos I took was a little excessive.) I recommend dinner at Alan Wong's Hualalai Grille (Four Seasons, Kona) if you're nearby and want some fine dining. Thank you so much for these suggestions! I can't wait to try the mochi at Two Ladies Kitchen--so many people have told me about it! OMG, thank you for catching this oversight! My goodness but that cake of yours looks so gorgeous! I love peaches too but they are way too expensive here! Beautiful photos! Wow, what a stunning cake! wow - that's the prettiest cake I've ever seen!